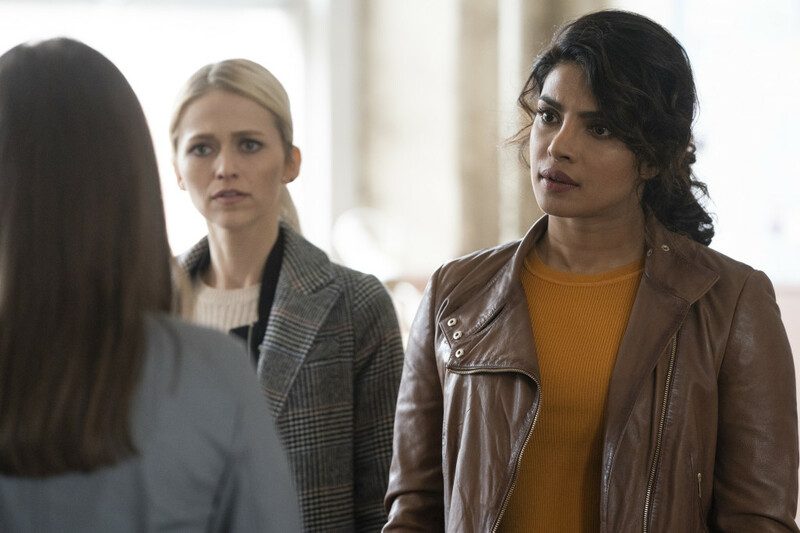 It’s the final episode ever for “Quantico” (ABC, 8 p.m.), the spy yarn starring Priyanka Chopra, whose character has her final showdown in Ireland with her archenemy to close the action. “Animals” (HBO, 11:30 p.m.) has always been a strange show, focusing on the human quirks of urban critters (who, so as to aid the more tedious side of animation, don’t move their mouths when they talk). For season three, humans have been eliminated from the equation altogether, as some sort of apocalypse has wiped them out, causing new hierarchies on the ground. But humans do appear — in the series’ first live action shots — as scientific observers. It’s followed by the new “Random Acts of Flyness” (HBO, midnight), a new series from Terence Nash that throws all kind of approaches — animation, documentary, music performances, skits — together to see what happens. In the new feature “Like Father” (Netflix, streaming) Kristen Bell is a bride left at the alter who decides to bring the father she doesn’t know too well on the honeymoon she had planned. He’s played by Kelsey Grammar. Also new online today is the series “I am a Killer” (Netflix, streaming) in which death row inmates tell of the deeds that got them locked up. In the imported scripted series “Cocaine Coast” (Netflix, streaming) a fisherman in Galicia, Spain gets involved in drug trafficking for Latin American suppliers in the 1980s. Crafter Kevin “Mad Dog” McClung makes weapons and tools on his show “Mad Dog Made” (Discovery, 10 p.m.). “Marching Orders” (Netflix, streaming) is a documentary series focusing on the inner drama of a to—ranked college marching band at Bethune-Cookman University in Daytona Beach. Malcolm Nance, Nancy MacLean, Kristen Soltis Anderson, Charles Blow and Steve Schmidt are guests on a new “Real Time with Bill Maher” (HBO, 10 p.m.). Kirsten Gillibrand is profiled on “Breaking Big” (PBS, 8:30 p.m.). “In Search Of” (History, 10 p.m.) examines ocean creatures. Zeph faces possible death on “Killjoys” (Syfy, 10 p.m.). New episodes of “TKO: Total Knock Out” (CBS, 8 p.m.) are starting to appear on Fridays, a bad sign? Ratings haven’t been great. Its host returns later at night for the second season start of “Kevin Hart Presents: The Next Level” (Comedy Central, 11 p.m.), a showcase of new stand-ups. The Black Badge Division arrives on “Wynonna Earp” (Syfy, 9 p.m.). “Whistleblower” (CBS, 9 p.m.) features a case against Wells Fargo and some cardiologists. A fake baby is left in a hot car on “What Would You Do?” (CBS, 9 p.m.). “The Great British Baking Show” (PBS, 9 p.m.) focuses on crispbreads. There’s a last-chance tournament on “BattleBots” (Science, 8 p.m.). “The Dead Files” (Travel, 9 p.m.) goes to Fort Barnwell, N.C., and then, at 10, to Oregon, Ohio. The English actor Lionel Atwill is featured for the first time on Turner Movie Classics’ Summer Under the Stars with movies all day: “The Firebird” (6 a.m.), “Rendezvous” (7:30 a.m.), “The Solitaire Man” (9:15 a.m.), “The Secret of Dr. Kildare” (10:30 a.m.), “The Murder Man” (noon), “The Age of Innocence” (1:15 p.m.), “The Secret of Madame Blanche” (2:45 p.m.), “The Devil is a Woman” (4:15 p.m.), “Captain Blood” (5:45 p.m.), “The Mystery of the Wax Museum” (8 p.m.), “Secret of the Blue Room” (9:30 p.m.), “Doctor X” (11 p.m.), “Absolute Quiet” (12;30 a.m.), “The Vampire Bat” (2 a.m.), “Mark of the Vampire” (3:15 a.m.) and “The Gorilla” (4:30 a.m.). Baseball includes San Diego at Cubs (MLB, 2 p.m.) and Yankees at Boston (MLB, 7 p.m.). WNBA action has Las Vegas at Washington (NBA, 7 p.m.) and Minnesota at Seattle (NBA, 10 p.m.). Canadian football has Hamilton at Montreal (ESPN2, 7:30 p.m.). Kelly Ripa and Ryan Seacrest: Taylor Schilling, Katie Lowes. The View: Michael Avenatti, Ana Navarro. The Talk: Uzo Aduba, Amandia Stenberg, Morgan Fairchild, Carnie Wilson. Harry Connick: Danielle Brooks, Lauren Makk, Dawn Russell, Jessielyn Palumbo, Iman Oubou (Rerun). Steve Harvey: Tracy Morgan, beverly Bond, Kaitlyn Bristowe, Garcelle Beauvais, Shan Boodram (rerun). Ellen DeGeneres: Ewan McGregor, BTS (rerun). Wendy Williams: Kate Walsh (rerun). The Real: Zonnique Pullins, Tameka Cottle-harris (rerun). Stephen Colbert: Rob Reiner. Seth Meyers: Amy Poehler, Fall Out Boy, Nate Smith (rerun). James Corden: Heidi Klum, Thandie Newton, Zlatan Ibrahimovic, Alice Merton (rerun). Carson Daly: Louie Anderson, Warbly Jets, Mike O’Brien (rerun).